Mater provides exceptional healthcare services through all stages of life, for both non-insured and insured patients. Mater Hospital Brisbane and Mater Mothers' Hospital provide a breadth of service that ensures peace of mind and security for our growing community. Mater Private Hospital Brisbane is one of Australia’s leading acute medical and surgical private hospitals, offering a range of general and specialised services in comfortable hotel-like surroundings. 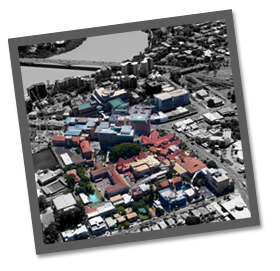 In 2000, Mater expanded our services to the bayside community, with the establishment of Mater Private Hospital Redland. Mater is also meeting the growing healthcare needs of the Greater Springfield community by building Mater Private Hospital Springfield. Private maternity and paediatric services are also available at Mater through Mater Mothers’ Private Brisbane, Mater Mothers’ Private Redland and Mater Children’s Private Brisbane. Information about all Mater hospitals, including visiting hours, locations and patient information is available via the Mater website. The many buildings that comprise Mater's complex stand as a true testament to the Sisters of Mercy's Vision and Mission. As a ministry of Mercy Partners, Mater Health Services continues to operate and provide healthcare in the tradition of Mercy. Each building has been conceived for a specific purpose and as vehicles for Mercy and Mater Values in action. These Values—compassion and service to the poor and the afflicted—have been the guiding spirit of the hospitals. Each hospital also reflects a significant commitment from the community. From the beginning, the Sisters relied on public contributions to help achieve their goals. These buildings attest to the foresight of the many individuals who, through their support of Mater, invested in the health of future generations. It is this factor that ensures each building is socially, as well as architecturally, significant in Queensland's heritage.